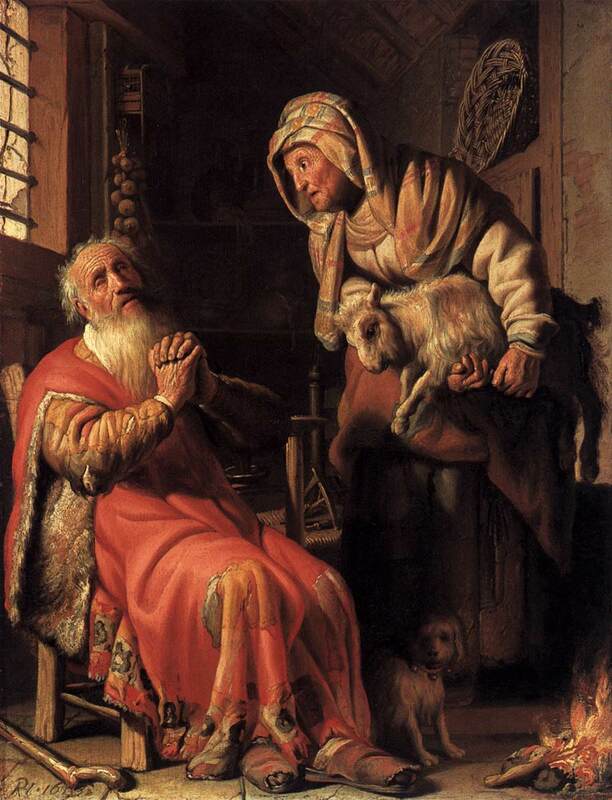 The subject of the painting was taken from the Apocryphal Book of Tobit. Tobit was a wealthy and strict adherent to Mosaic Law. He lost all of his money and was blinded by an accident. The wife went to work sewing and washing to support the family. 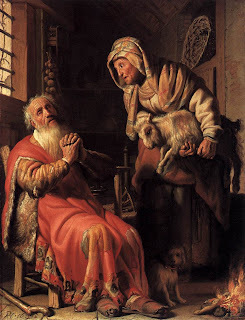 She brought home a kid goat and Tobit accused her of stealing it. She chastised him for his self-righteousness and frees him from his limited thinking. Later their fortunes are restored by the efforts of their son and his eyes fixed from blindness from fish entrails. The painting helps us think about how even from the lowest depths man’s lot can change. It is difficult for us to judge others with any real sense of accuracy. To do so requires the ability to weigh and balance all of the possible reasons and justifications. Unfortunately, many of us make the fatal mistake of using self-righteousness to make ourselves look better than and more moral than others. In this case, freeing himself from his narrow thinking also freed him to improve his life. The painting is from Rembrandt and was completed in Leiden in 1625. He had a knack for putting religious themes and emotion within his paintings. These emotions related around concepts such as joy and anguish. As he got older his paintings improved expressing such feelings with ever increasing finite detail. He turned from a timid painter to a bold painter with lifelike scenes. Rembrandt made a mistake in this painting and covered up an object. He painted over a spinning wheel to express the anguish and supplication better with Tobit’s hands. The wheel would have shown the rest of the story and difficulties his wife was having to make ends meet but would have confused the area. One can still see a part of the spinning wheel and spokes. Tobit’s is naturally darker in this area. Rembrandt, known as Rembrandt Harmenszoon van Rijn, was born in 1606 during the Dutch Golden Age. He is seen as one of the world’s greatest painters. Even though he achieved success early in his life and his paintings were popular throughout Europe during his lifetime he had significant financial hardship in his later years. He liked to buy lots of unique works and had an extensive collection. Perhaps more than he could afford. Eventually he needed to liquidate his work through bankruptcy. One unique feature of Rembrandt was his stereo blindness. An analysis of a number of paintings helped to determine that his two eyes did not function together well. He did not perceive the same level of depth as others. This flattening made it easier for him to draw pictures on a two dimensional canvas. This became a modern method of teaching art students to close one eye while painting to create the same effect.